In this edition of the JRC Capital Management Weekly Outlook, we present you our review on the USDCAD. The dollar strength of the past months decreased in this year. In addition, commodities gained in value. Among others, the price for a barrel of the crude oil WTI rose by more than 18% since the beginning of the year. Hence, the USDCA experienced a downward trend and lost more than 600 pips this year. In the past days, downward pressure increased because of the Fed’s statements during the last press conference. A rate hike was not expected. However, the subsequent statements were estimated as too dovish. The last US-American job report that was published this Friday led to negative reactions. Even though the Nonfarm Payrolls were better than expected, the unemployment rate increased due to a higher participation ratio. Primarily US-data are expected for the coming week. Starting on Monday, with the personal consumption index and the durable goods orders. On Tuesday, the US trade balance and the ISM non-manufacturing index will be published. On Wednesday, we expect the Canadian building permits and the crude oil inventories from the USA. On Friday, we are awaiting the Canadian job report. Furthermore, news about the trade war or the fiscal budget debate could affect the markets. We can see a downward trend in the USDCAD since the beginning of the year. However, the superordinate trend is still bullish. Currently, the price is at a critical level. The 61.80% Fibonacci was broken on an intra-day basis and now the price is slightly above a long-term trend line, which is situated at 1.3066. If the USDCAD falls below this level, further downward pressure could arise. We can locate another important support area at 1.2782, the low of the previous correction. If the price falls below this level, the upward trend would be broken, from a technical point of view. In case the USDCAD bounce off from this support area and recovers, we can locate an important resistance area at 1.3400. Several times in the past this level has been a turning point. 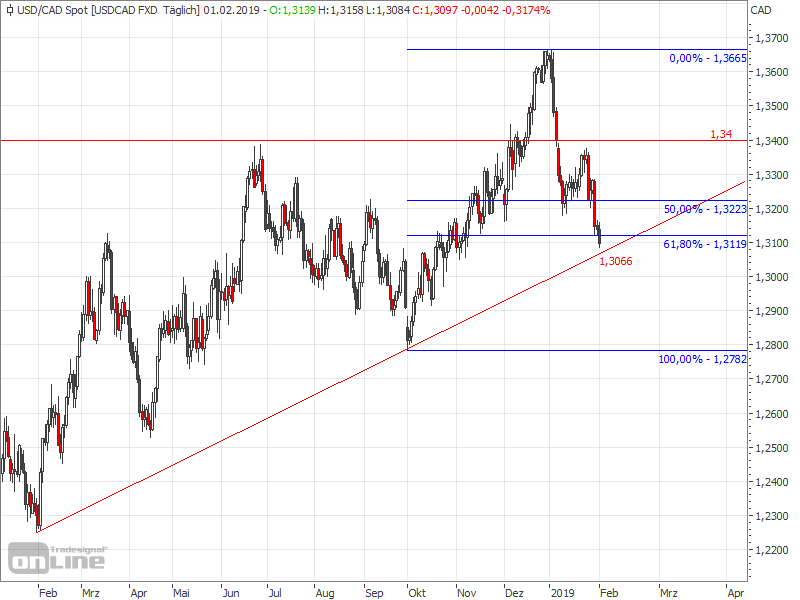 On the long run, the USDCAD has to rise above 1.3665 in order to confirm the upward trend.